The division of the Savu society into two female moieties has been transmitted in collective memory in the form of a narrative recounting a weaving competition between two sisters who consequently were considered as the origin of the two moieties, Greater Blossom (hubi ae) and Lesser Blossom (hubi iki). These moieties are highly relevant in marriage alliances. In the past a man was not allowed to marry in the other moiety; he had to marry in the same female line as his mother and maternal grandmother. Hence the composition and the patterns displayed on women’s sarongs (èi) distinguish clearly the women of the Greater Blossom and those of the Lesser Blossom. The patterns are obtained through a tie-dye technique (ikat) applied on the warp threads before weaving. Fig. 1. Wokelaku, the basic motif of the sarong for the Greater Blossom. It is angular and geometrical comprising three lozenges. Fig. 2. Motif ledo for Lesser Blossom (hubi iki). 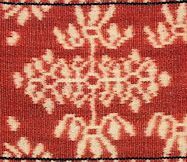 It is made of undulating lines which are more difficult to obtain through the ikat process than angular motifs. 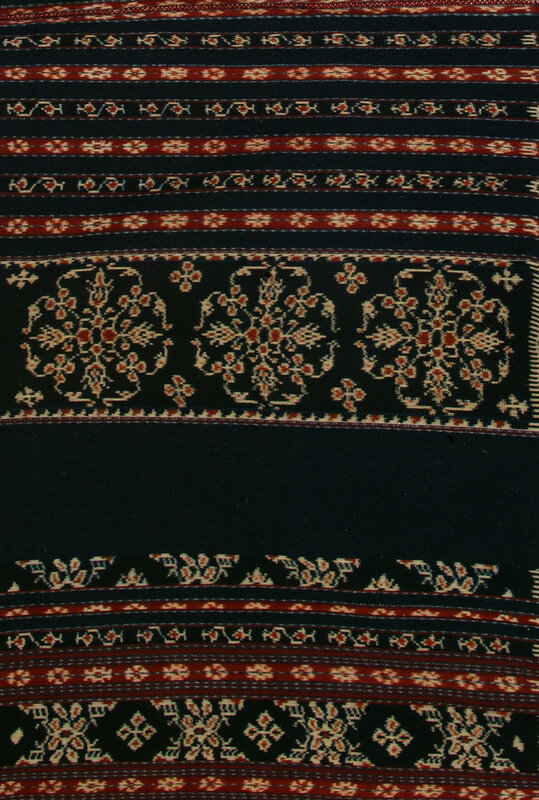 The shades of colour of weavings of hubi ae are lighter than those of hubi iki, especially for indigo which can be almost black for the members of Lesser Blossom. The difference of shade of colour has a reason too. In Savu as in many Austronesian societies, two siblings are at the origin of the social organisation. In the case of two brothers, the elder one takes the male role while the younger one has female symbols. One only needs to think of the local translations of titles like First Regent (raja) and Second Regent (Ratu in Indonesian or Feto in Timor and surrounding areas). The title ‘Ratu’ (often wrongly translated as ‘queen’) does not necessarily mean ‘female’, but second in rank. On Timor feto / weto also means ‘female’; on Savu the ‘fetor’ is the Second Regent who due to colonial rule was always a man. In Savu the pair of siblings is female; yet the elder sister carries male attributes like lighter shades of colours and odd numbers while the younger sibling has female characteristics as dark colours and even numbers. (For myths related to dyes and weaving, see Ikats of Savu, 2001). To an untrained eye, the woven cloths of Savu might lack variety in composition and colours. However the traditional use of only three colours has its reasons. The natural colour of the cotton (white), the blue-black colour from indigo leaves, and the red from the roots of the morinda tree (mengkudu, Indonesian, or kèbo, Savuneese) are the primary colours of ancient Austronesian people who settled in Indonesia during the first millennium if not earlier. (See for comparison the decorations of houses and/or of textiles in Sumatra, Bali, Kalimantan, Sumba, Toraja, Tanimbar for example.) In Savu these three colours are the three vital constituents of the body, or fundamental ‘bloods’ (‘humors’) contained in every living being. Raa in Savunese (or darah in Indonesian) means blood. A stable presence of these three bloods corresponds to a cosmic balance and a healthy physical state for the body, as well as for the textiles protecting the body. Fig. 3. Composition sarong hubi iki, wini Jawu. Black edges at middle seam for hubi iki. Half piece seen. → warp direction. A sarong is produced at once and later cut into two identical halves, then sewn together. Therefore the tubular cloth is perfectly symmetrical. A weaver in her planning and calculations refers always to the piece as it is on the loom (thus she refers to the half piece). The difference in the number of plain bands, called ro’a (seven small plain bands in blue indigo for the Greater Blossom, and four larger plain bands dark blue to black for the Lesser Blossom per half piece) are essential and easily identifiable markers in Savu. The term ro’ais to be found in the boat terminology; it is the space between two planks which is filled with bark. It is also the space between two rafters of the roof of a house. This shows how the boats which brought the ancestors, the houses they built in the shape of boats, and the woven cloths were part of a vital concept of early settlers. Most of the terminology of a textile is derived from the human body since a weaving is considered as a living being with its vital forces present in the three colours. The middle seam (bèka) is also the backbone (rudebo) while the ends are the delicate eyes (wurumada). The small ikatted motifs (j’uli ngiu) between the two ro’a are the heart and the liver (thus the centre of emotions). 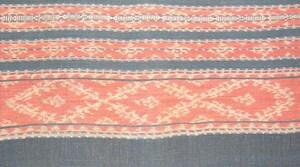 The space next to the end of an ikat band is the throat and the breath (hengaa). Hengaa has a second meaning, soul. 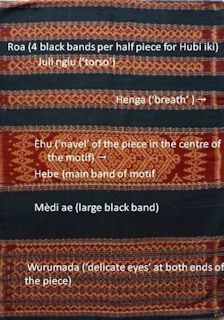 The central area of the main band of motif (hebe) is the navel (èhu) of the piece. In the course of time, each moiety formed subgroups, called the ‘seeds’ (wini, Savunese, or bibit, Indonesian), and each wini owns at least one specific motif and one ritual house (tegida) for worshiping the founding ancestress of the group. There are seven wini for the Greater Blossom (D’ila, Ga, Mèko, Pi’i, Migi, Raja and Waratada) and three for the Lesser Blossom (Jawu, Putenga and Waratada). An even larger number of wini is to be found on Raijua. Some wini have formed further subgroups named only after a particular ancestress, for example the ritual house of Ina Loni Dimu, in the village of Pedèro, Mesara, was built by a subgroup of wini Ga (Greater Blossom) in the mid-18th Century. (Ina Loni Dimu was the wife of, the raja of Mesara, Dimu Kore, who signed the treaty of Paravicini in 1756). Wini Putenga (Lesser Blossom) also formed a number of subgroups. With the creation of the function of raja (Regent) and fetor (Second Regent) during colonial times, a new ruling class emerged. Women of this group started to differentiate their textiles while adding small bands of supplementary warp weave, simply called raja to differentiate themselves from the common people, giving the name raja to the cloth. Conversions to Christianity started also among the ruling classes. It is very possible that the neutral sarong èi worapi, found its origin among the newly converted wives and daughters of ruling families. They also developed new patterns like the patola motifs derived from Indian cloths, or the lèba pattern which simply means ‘restricted’ or ‘taboo’. Their use is similar to the larangan (Indonesian) motifs of Javanese batiks at the courts of Yogyakarta and Solo. The lèba pattern reminds us of two stylised naga, also a loan pattern. It has to be noted that there are two patola motifs, one for the Greater Blossom (Fig. 5) and one for the Lesser Blossom (Fig. 6) so that the group identity of the wearer of a sarong displaying the motif patola stays visible. The textiles specific to a wini are (or were) kept in the tegida (see chapter tegida), the ritual house of a wini. However as in many places in Indonesia, mass conversions to a modern religion occurred in the 1970s. Since the majority of the people in Savu are now Christians, Christian weavers no longer feel obliged to follow the rules of the ancestral religion, Jingi tiu, and no longer attend meetings at the tegida. Fig. 7. 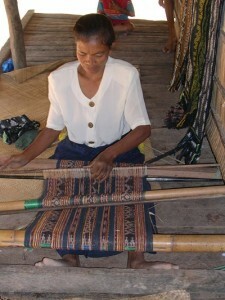 A master weaver of Ledetadu, Pedèro, making a shoulder cloth. Today most of the sarongs of the Greater Blossom display raja stripes, people being eager to imitate the former ruling classes since there are no longer rajas. 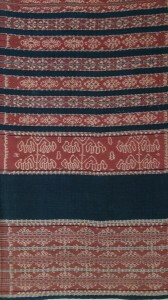 However the preferred sarong of Savu women is today of the worapi type, although the ikat process to create three colours in the bands of motifs is more elaborate and time-consuming (Figs 5, 6 &7). The main motif can be traditional in which case it is abstract, geometrical, or a new creation according to fashion and taste of the weaver. Thus, the weavers can show today a variety of motifs no longer related to their group of origin, thus losing identity markers. Fig. 8. Motif kobe mola'i © (16th C) for descendants of Mojo Lado, wini Ga, hubi ae. It has to be noted that the geometrical and abstract patterns are linked with very early ancestresses whose names are to be found in the mantra genealogies; for instance the kobe morena motif of the ancestress Ga Lena and the wod’ila motif of D’ila Robo Ab’a are anterior to the Portuguese times. 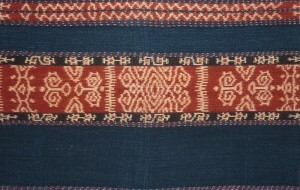 This shows that the ikat technique was known on the island before the arrival of the Europeans. The kobe molai motif was created by the turbulent Mojo Lado, the wife of the 3rd raja of Seba (Haba Jami) of Portuguese times. Patterns function as time markers and it is remarkable for a society with no written tradition to demonstrate such depth of memory.